War of the Ring, first published in 2004, is a two player wargame that attempts to recreate the Lord of the Rings. Players will struggle over the One Ring and the Strongholds of Middle-Earth using their Armies and Characters. This is the most epic, thematic game I’ve ever played, and I wish I could play it more. Hence this thread. 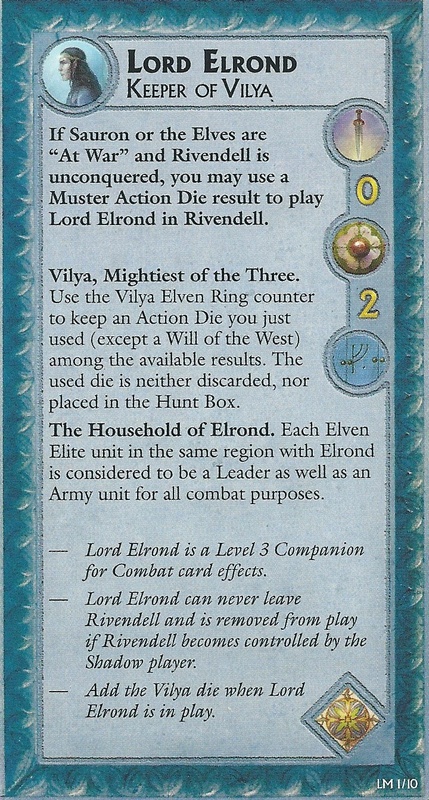 For this game, we'll be using the 2012 expansion Lords of Middle-Earth. The biggest thing it adds are Keeper and Lesser Minion dice, which function like regular action dice but aren't as powerful. 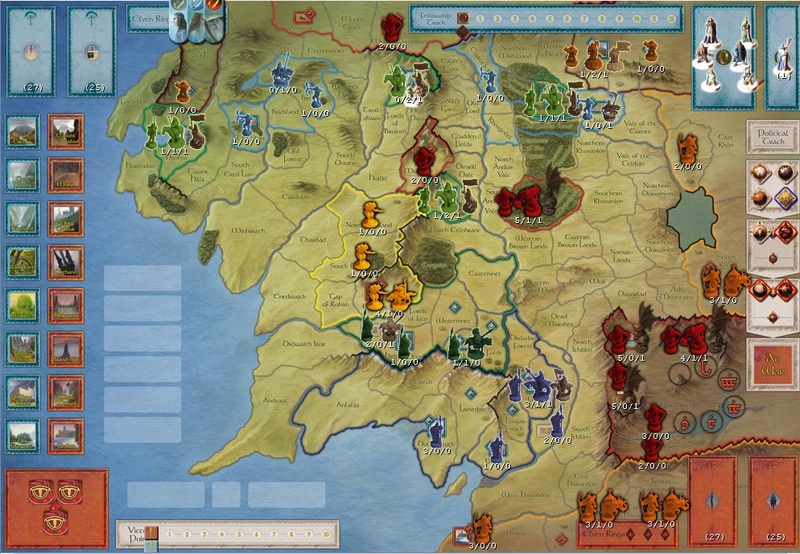 I’ll be using the War of the Ring Java App to run the game. Toshimo and Gutter Owl will be our players this game! Toshimo has requested to be the Shadow Player(SP), so Gutter Owl will be our Free People Player(FP). I'll be sending out opening hands shortly. 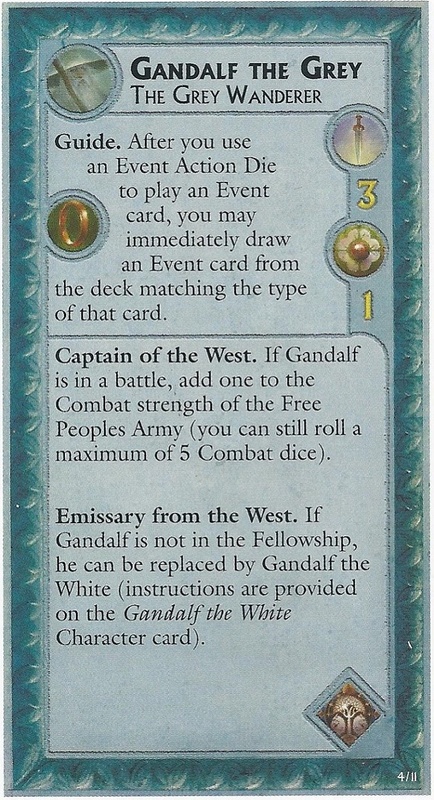 I also won't be using the Council of Rivendell variant this game, so Gandalf: Keeper of Narya will be the only alternate Companion in play. FP, would you like Gandalf: Keeper of Narya or Strider to start as the Guide? 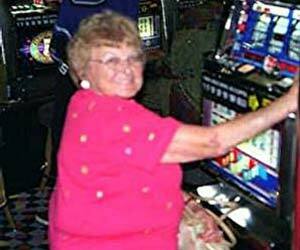 SP, how many dice would you like to allocate to the Hunt? I, too, have lost a kingdom. drat that's a lot of character dice. Uh. Dang. That's...a hard row to hoe right out the gate. 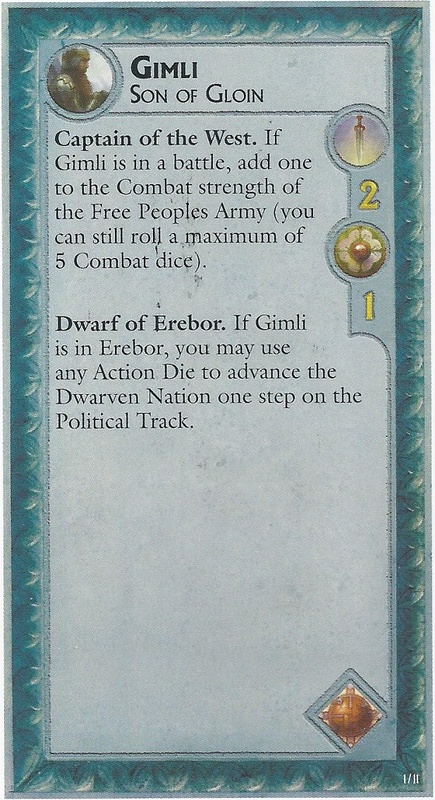 Use Narya Die to move the Fellowship. 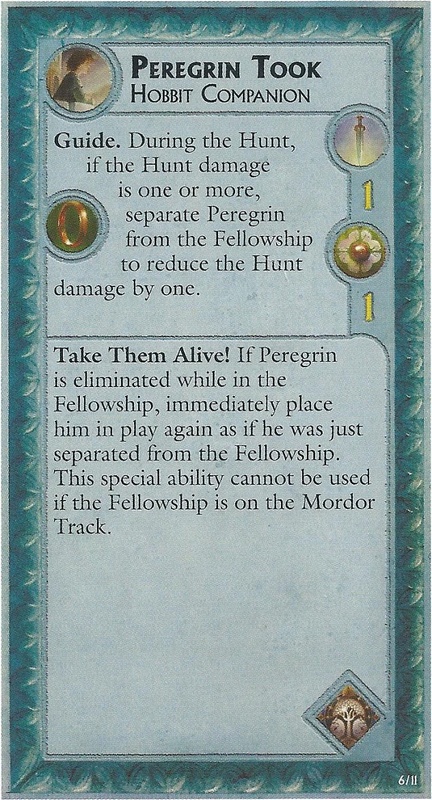 FP uses a Character die to move the Fellowship. Army die to move Elite+Regular from Near Harad to West Harondor. Belay that, if possible. Forgot it's two armies, not two units. Sure. What would you like to do instead? 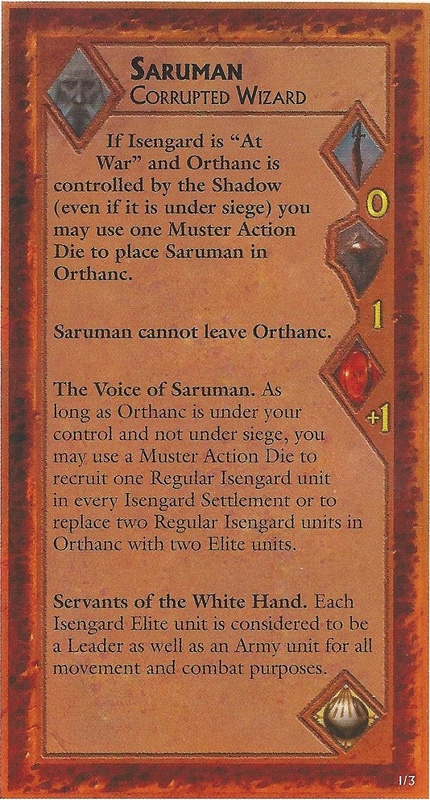 Army die to move all units from Barad-Dur and Nurn into Gorgoroth. SP uses an Army die to move the Armies in Nurn and Barad-dûr to Gorgoroth. Hell with it, let's be dangerous. 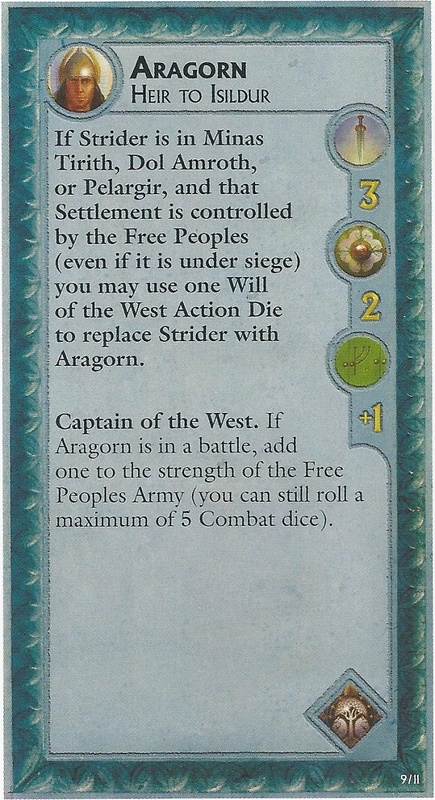 Per PM, SP uses an Army die to move the army in Far Harad to Near Harad and the army in Minas Morgul to North Ithilien. 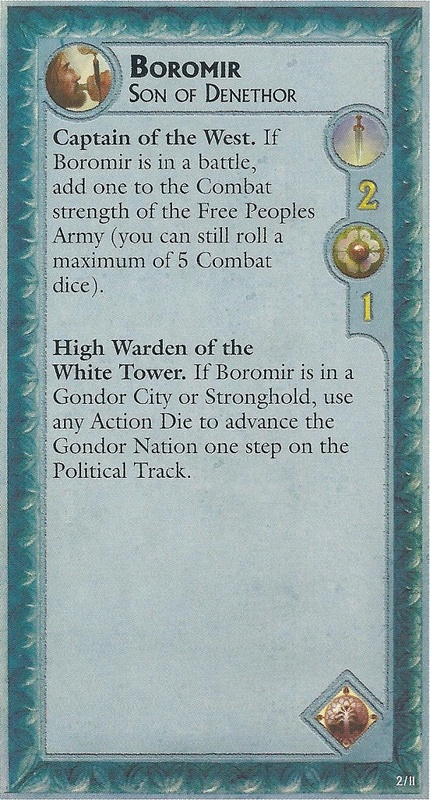 FP uses an Army/Muster die to advance Gondor one step on the Political track. Army die to move all units from Gorgoroth to Minas Morgul and all units from South Rhun to East Rhun. poo poo's about to get real. SP uses an Army die to move the army in Gorgoroth to Minas Morgul and the army in South Rhûn to East Rhûn. A is drawn for two Hunt Damage. FP, would you like to take a casualty or use the Ring? Where would you like to reveal the Fellowship? Corruption is increased to two, and the Fellowship is revealed in North Dunland. 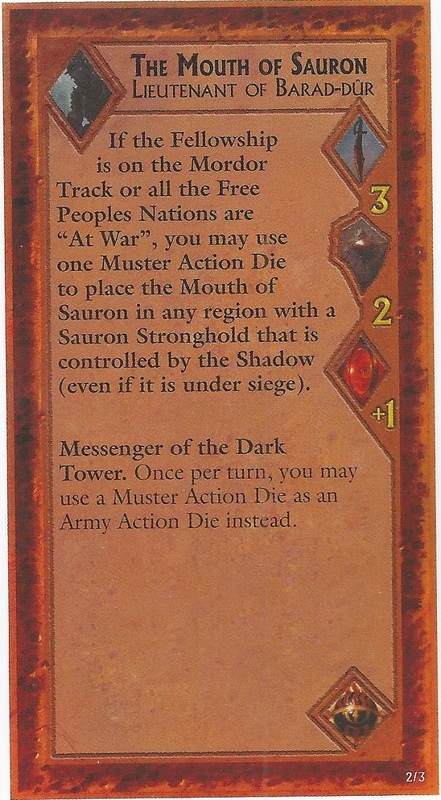 Per PM, SP uses a Muster die to play Threats and Promises to the table. 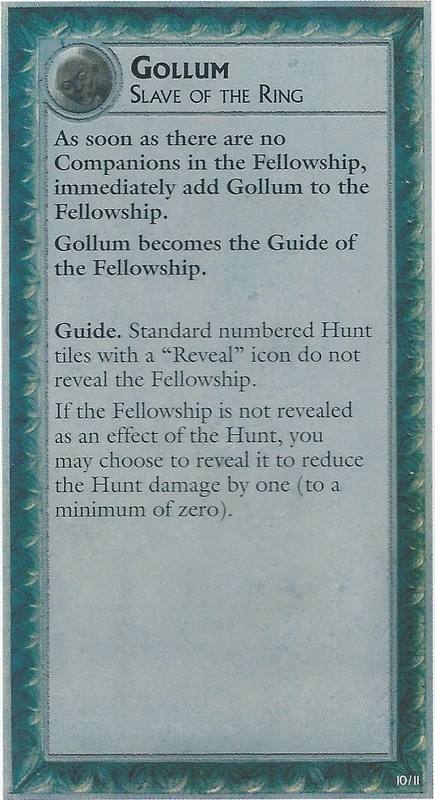 FP uses a Character die to hide the Fellowship. 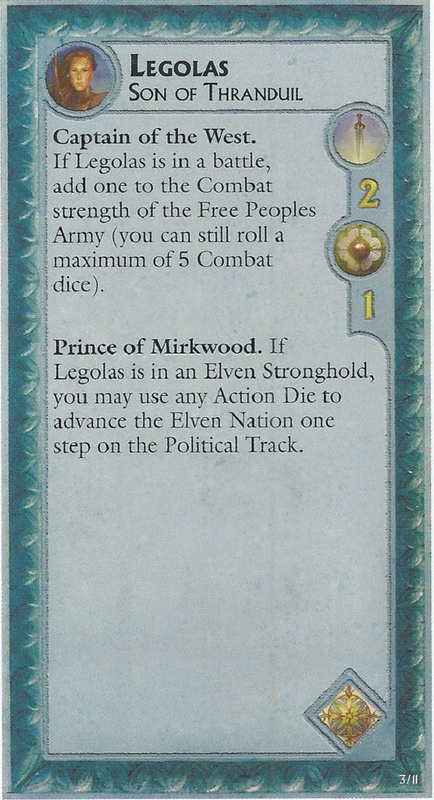 Recover Action Dice & Draw Cards: Gandalf is the Guide of the Fellowship and one FP die is recovered from the Hunt Box, so the Narya die remains in the Action Die Pool. FP now has four cards in hand; SP has three cards. 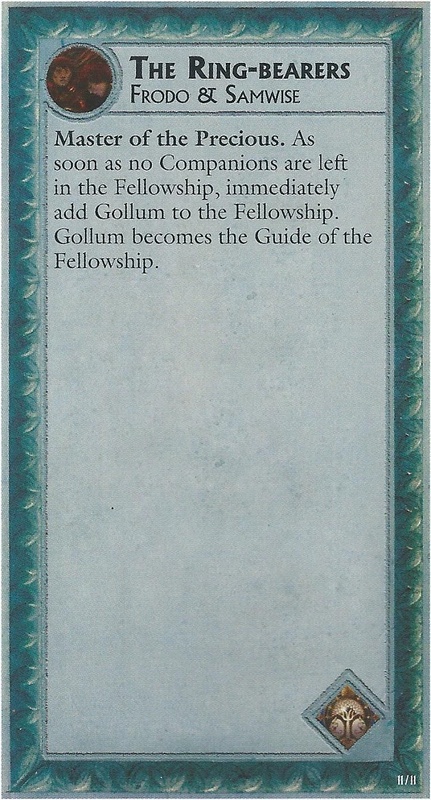 FP, would you like to change the Guide of the Fellowship? FP, would you like to take a casualty? FP uses the Ring and corruption is increased to four. 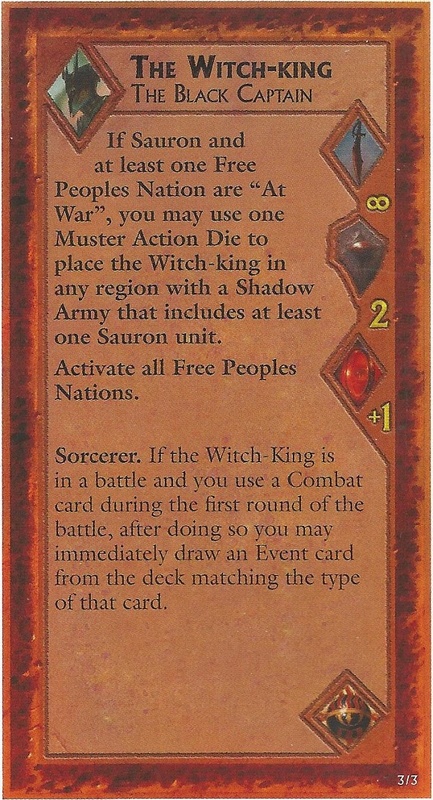 Per PM, SP uses an Army/Muster die to recruit the The Witch-King Chief of the Ringwraiths in North Dunland. Literally every time I play that character, I start saying that over and over. 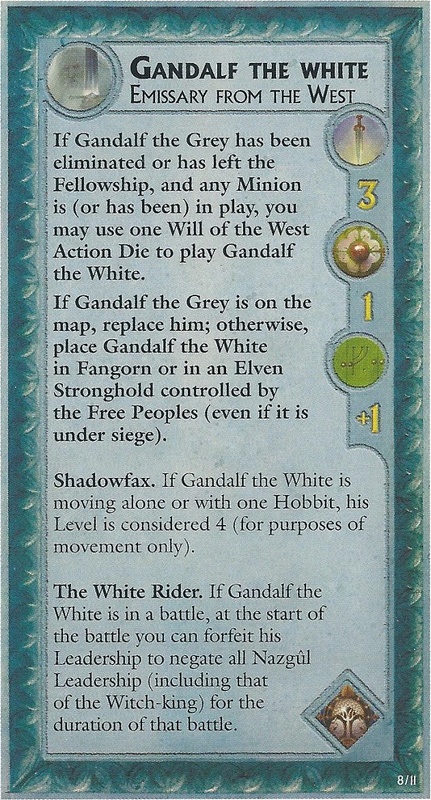 Character Die: Separate Gandalf and Strider into Helm's Deep. Boromir is the new Guide. 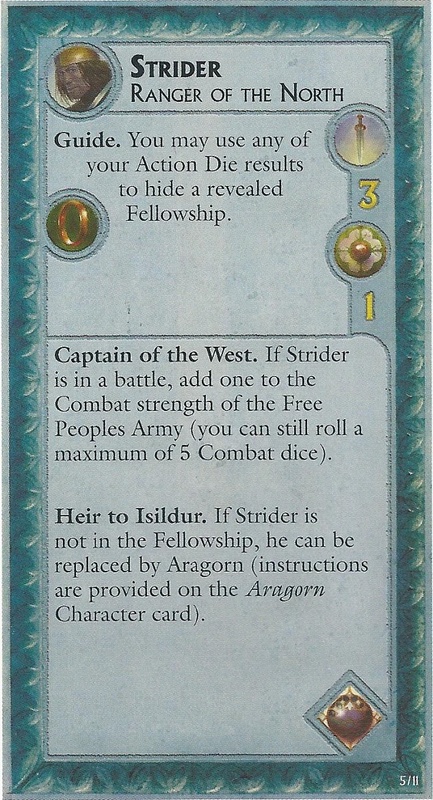 FP uses a Character die to separate Strider and Gandalf from the Fellowship, placing them in Helm's Deep. 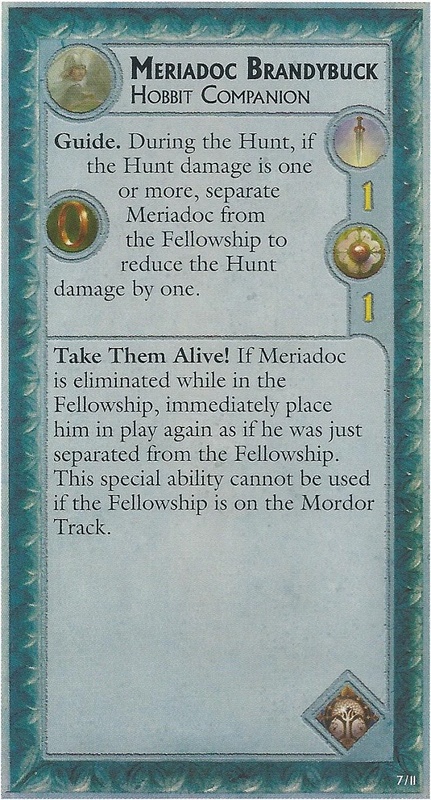 Boromir becomes the Guide of the Fellowship. 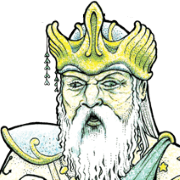 Gandalf Activates Rohan. Army die to move the army from Near Harad to West Harondor and the army from Minas Morgul to South Ithilien. SP uses an Army die to move the army in Minas Morgul to South Ithilien and the army in Near Harad to West Harandor. Arise, arise Riders of Theoden! Fell deeds awake: fire and slaughter! Ride for ruin.. and the world’s ending!